National Child Passenger Safety Week was Sunday, September 18th through Saturday, September 24th. The Week wrapped up on September 24th with National Seat Check Saturday—a call to action encouraging parents, other caretakers, and anyone responsible for driving with children to make sure that appropriate seating is being used when driving motorized vehicles. Taking the time to learn about child passenger safety is an opportunity to refresh knowledge on practical steps that may prevent motorized vehicle related injuries and fatalities among children. According to the Centers for Disease Control and Prevention (CDC) motor vehicle injuries are one of the leading causes of death among children ages 12 and younger in the U.S. The CDC estimates that in 2014 over 121,350 children ages 0-12 were injured, and 604 children between these ages died in motor vehicle accidents. Child passengers are at higher risk for dying in motor vehicle accidents when they are not buckled up, when they are passengers in a car being operated by a drunk driver, when child safety seats or booster seats are not used properly, or when exposed to any combination of these risk factors. How can parents, caretakers, and other drivers responsible for the health and wellbeing of children practice safer seating practices? Becoming familiar with types of seating available for child passengers is one step toward promoting child passenger safety. Knowing how to use the type of car seat best suited for a child based on the child’s age and size can actively protect against serious injury and may save a child’s life. This CDC chart (pictured below) demonstrates seating options for child passengers according to the child’s age and size. Every type of child passenger seating recommended by the CDC has been found to protect children from physical injury or death resulting from a motor vehicle accident. The use of car seats in passenger vehicles can reduce the risk of death among infants (from 0-1 years old) by 71% and among toddlers (1-4 years old) by 54% according to the CDC (2016). Using a booster seat secured with a seatbelt can reduce the risk of a child passenger (ages 4-8) being injured in an accident by 45% when compared to only using a seatbelt. And lastly, the risk of serious injury and death while driving in motor vehicles can be lowered by almost half when adults and children properly use seatbelts. safercar.gov features tips on how to find the right car seat according to a child’s age and size, and how to properly install a car seat. 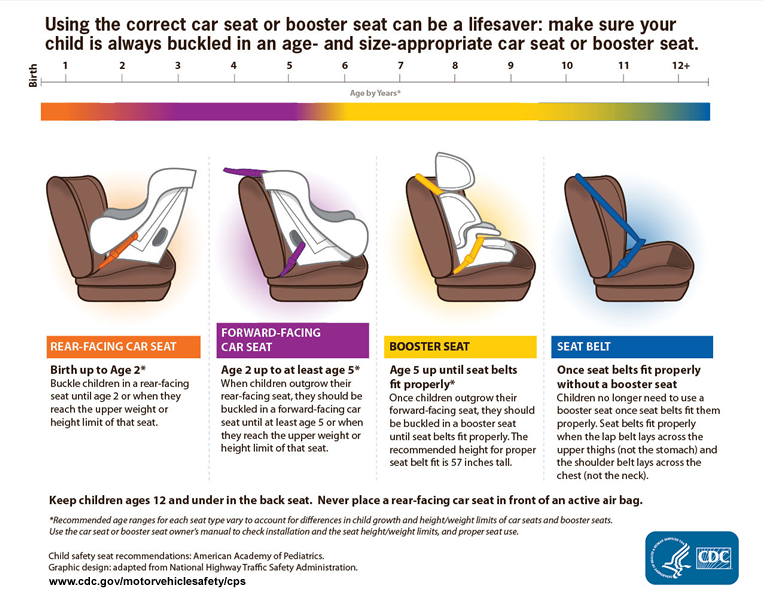 The National Child Safety Board has designed a useful chart outlining car seating recommendations for children from birth to 12 years old. The CDC’s Injury Prevention & page on Motor Vehicle Safety includes statistics on child passenger safety and information on how to reduce the risk of motor vehicle injury. The Detroit Medical Center (DMC) partnered with Kohl’s Injury Prevention Program offers a Safe Travel Program. Check out upcoming car seat check events hosted by the Michigan State Police at local fire department stations, shopping centers, health centers, and other convenient locations. The Safe Kids coalition offers tips and pointers on car seat safety. Beaumont (formerly Oakwood) Health System provides one on one assistance by helping you find someone near your home who can help show you how to properly install and use a car seat. CDC. Injury Prevention & Control: Motor Vehicle Safety- Child Passenger Safety [online]. National Center for Injury Prevention and Control, Centers for Disease Control and Prevention. [19 August, 2016].